Applying release agent to the steel belt immediately before the product infeed ensures more effective removal of pastilles from the steel belt. With the spraying system, the steel belt is only coated with the amount of release agent needed to reduce the adhesive force between the pastille and the steel belt. 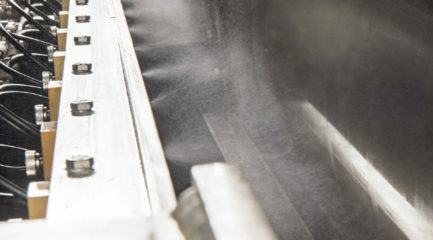 This prevents damage to the pastilles on the scraper and significantly reduces the amount of dust generated.